News on current hiking trail and hiking information in Oklahoma. Featured hike in Oklahoma for the current month. Groups who support hiking in Oklahoma. The Feb. 7 rattlesnake attack against a hiker in the Wichita Mountains in the southwest part of the state has increased concerns about snake attacks in Oklahoma. The unfortunate victim lost his left leg above the knee, and many are asking what the best protection against venomous snakes might be. As demonstrated above, snake gaiters provide protection from ankles to knees and can be easily deployed when needed. 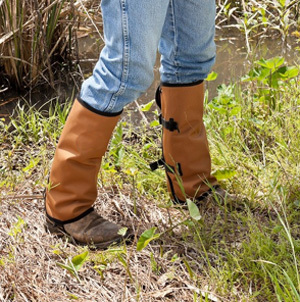 Snake gaiters can be purchased from outdoor gear stores and at a number of online sources. They are also good at protecting hikers from thorns and other irritating kinds of vegetation. The gaiters extend from ankle to knee. Most snakes that strike from ground level are unable to reach higher than a hiker's knees, so they provide adequate protection on level ground. Snakes can strike higher on a hiker's body if they hide in rock projections or in forest debris. Hikers in snake country should avoid walking by rocks and debris without a clear view of what's in and behind these potential hazards. And as this recent rattlesnake attack in winter shows, snakes can come out of hibernation during warm spells. So hikers should be vigilant year-around. The eight-mile Buffalo Trail stands out as the premier hike in the Dog Run Hollow Trail System on the western side of the Wichita Mountains Wildlife Refuge. The trail can be hiked clockwise or counter-clockwise from the trailhead at French Lake and is marked by depictions of a buffalo head on small signs along the trail. To hike the trail in a clockwise direction, cross the small metal bridge near the trailhead and turn left onto the trail. The well-marked pathway starts off a bit rocky and proceeds through the blackjack oaks along the south side of French Lake. Stay to the left and near the water as the trail crosses other small bridges and intersects other trails in the system. The trail continues past a series of small dams and at two miles out inclines to the top of a ridge. This ridgeline opens to a broad view to the east with Mt. Scott in the distance. The trail turns south just after the ridge. Passing by the 40-Foot Hole section of the creek, at about three miles the trail begins to turn back to the west. The trail is sometimes hard to follow on the route back to the trailhead at French Lake. Hikers should maintain a west-northwest bushwhack where the trail is sketchy.